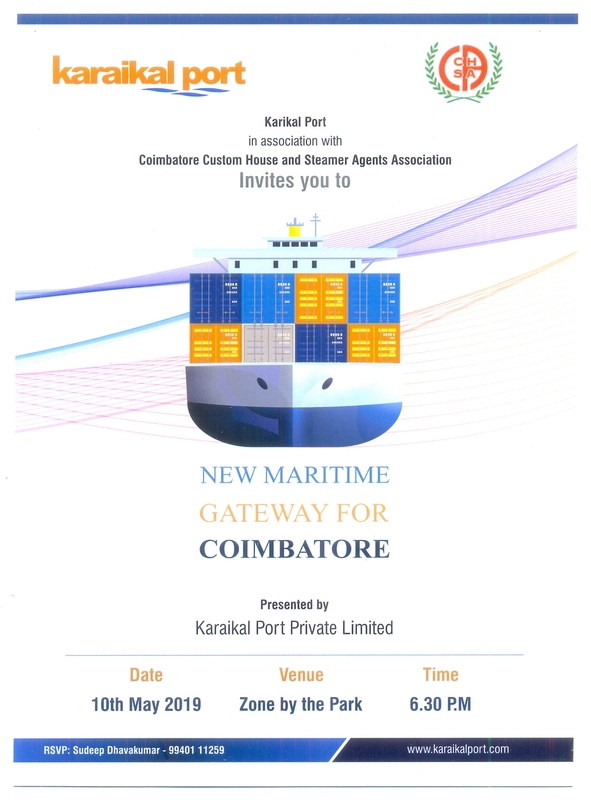 "CHAASAAC 10th annual cricket tournament scheduled on 11th and 12th May 2019 at PSG CRICKET GROUNDS, Peelamedu, Coimbatore-641014 "
"Karaikal Port in association with CHAASAAC invites to NEW MARITIME GATEWAY FOR COIMBATORE meet scheduled on 10th May 2019 6:30 PM at ZONE BY THE PARK, Coimbatore "
"E-SANCHIT workshop for exports held on 06.04.2019. Mr.Ajayan and Mr.Velraj jointly organized this at the request of CHAASAAC "
"Vide Non-Tariff Notification No.82-2017 dated 24.08.2017, Coimbatore and Tirupur Customs Formations brought under the Administrative Control of Trichy Commissioner from 16.09.2017"
"On 11.03.2019, CHAASAAC represented to The Principal Commissioner of Customs, Trichy to consider issuance of H-CARD with 5 years validity." "On 11.03.2019, CHAASAAC requested The Principal Commissioner of Customs, Trichy to consider G-CARD Examination for Coimbatore+Tirupur based candidates at Coimbatore itself on 04.04.2019"
The “Coimbatore Custom House and Steamer Agents Association”, popularly known as CHAASAAC, is a society registered under the Tamil Nadu Societies Registration Act, 1975 & was registered in the year 2003. CHAASAAC is recognized by the Commissioner of Customs as per requirement of CHALR 2004. Has a uniqueness in its member content, as this is the only association in India which has both Custom House Agents & Steamer Agents under a single umbrella. Freight Forwarders and Consolidators are also members of CHAASAAC. To liaise with all bodies in the exim trade for a better work flow & reduce dwell time.